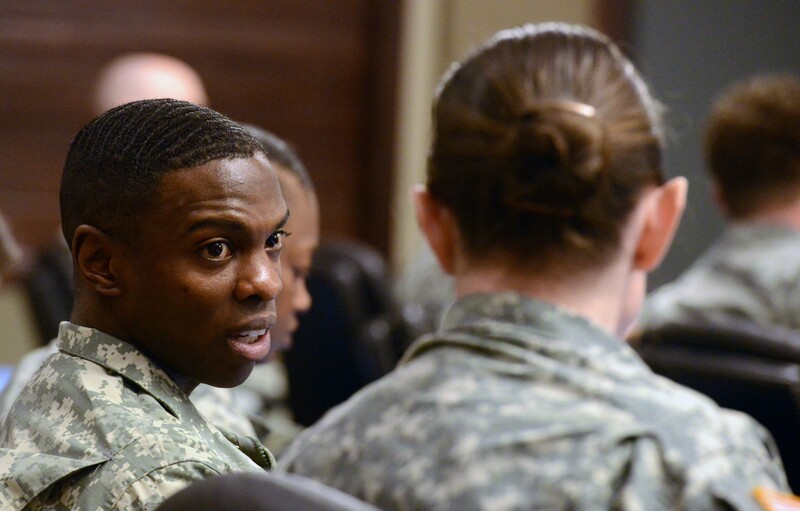 FORT LEAVENWORTH, Kan. (March 4, 2015) -- "The more unknown, complex and rapidly changing the environment is, the more important it is for you to have a really good conversation before you decide on a course of action," said retired Army Col. Steve Rotkoff. "And then you have to be prepared to change ... as events change." Rotkoff helped to facilitate discussion among the 84 captains, who participated in Solarium 2015, Feb. 24-26. As part of the Solarium event, seven teams of Army captains were challenged to discuss an array of Army-related topics and then provide their feedback on those topics to Army Chief of Staff Gen. Ray Odierno. 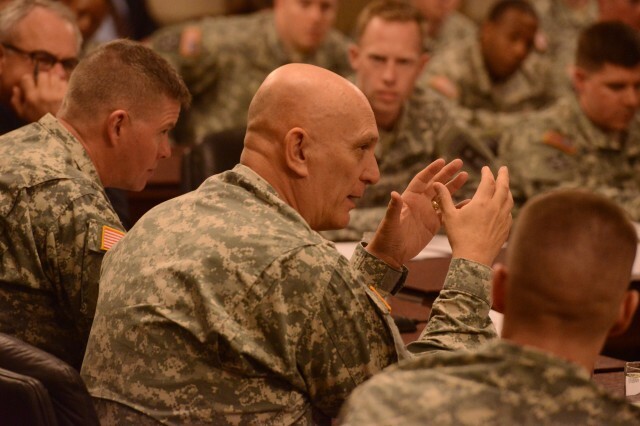 The Solarium 2015 event, hosted by the Center for Army Leadership, or CAL, at the Command and General Staff College, dealt with several topics relevant to the Army Operating Concept. 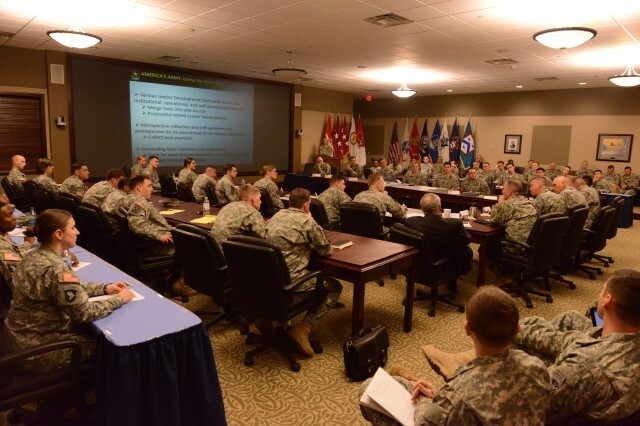 As part of guiding Army captains through group discussion, Rotkoff said that it is common for some in a group, and for subordinates, to withhold what might turn out to be great ideas. He said that in a group of 10 captains, for instance, the conversation will be mainly between just four of them, while the other six probably will not participate at all. Those captains who remain silent might be introverted, he said, or they might self-censor because they value relationships and do not want to offend if their ideas differ from those of the group leaders. "There are people in the room who will never tell you what you want to know unless you find a way to pull it out of them," he said. Rotkoff, having served at every level of military intelligence in the Army, appeared to be well suited to pulling information out of people. He shared some of his secrets, which can be found in the "Red Team Handbook 7.0," which was published earlier this year by U.S. Army Training and Doctrine Command. He referred to the methods as "group-think mitigation techniques." One such technique begins with a one-on-one discussion, followed by opening conversation up to small groups, and finally, writing down ideas. In this way, everyone's input is given. Following discussions, there is a 30-second moment of silence to reflect. Thirty seconds is a long time, he said, and frequently, more ideas will bubble up during that time of reflection. Finally, participants vote on what they think are the best ideas, and it will be those ideas that are brought forward by the group. 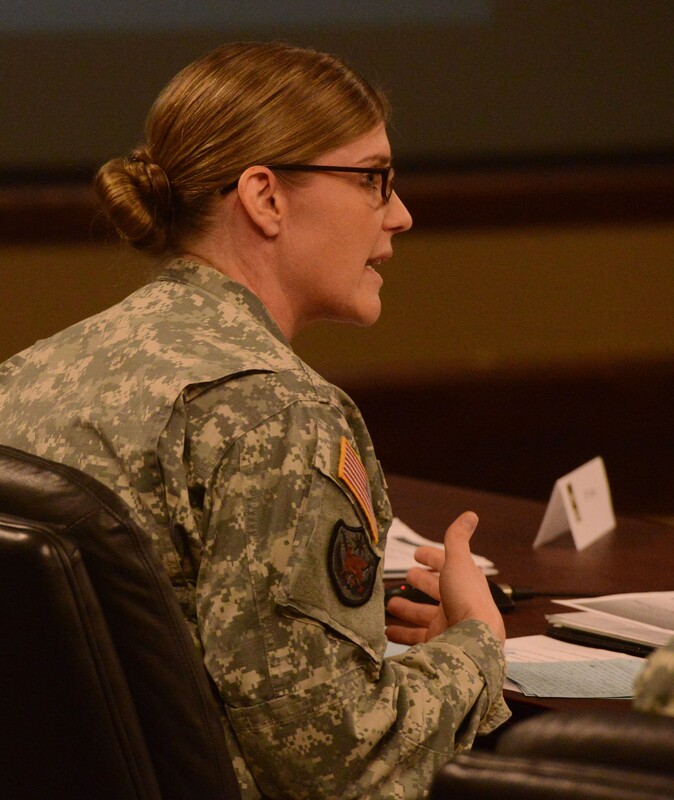 There are about 47 such techniques in the "Red Team Handbook," and many have been around the Army for almost a decade now. But it was at last year's Solarium 2014 and this year's Solarium 2015 where those techniques were proven, said Col. Christopher D. Croft, director of CAL. 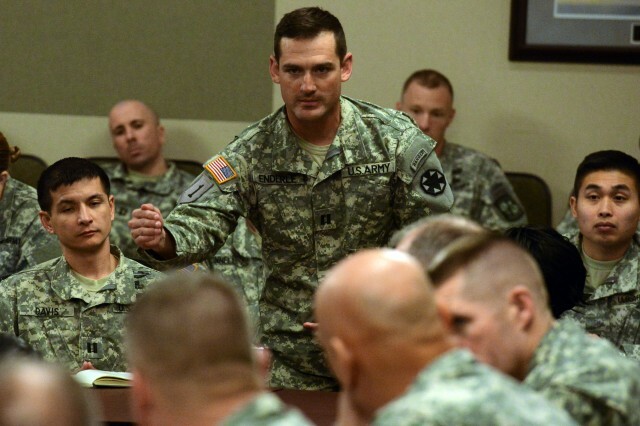 Rotkoff referred to a company commander who used the Red Team techniques at a required safety briefing he held before a holiday. Twenty seconds into the moment of silence, a young Soldier said he had nothing planned and would probably just go drinking. 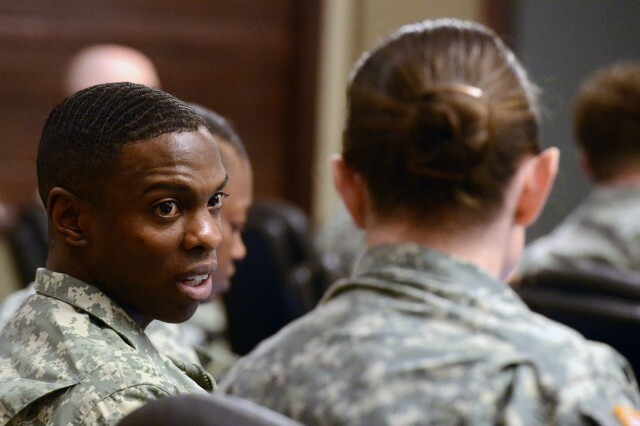 Immediately, other Soldiers offered ideas on things to do and some invited him to their house. The commander is now using the technique everywhere he goes and says it is a great way for ideas to bubble up from the bottom in any venue, Rotkoff said. Capt. 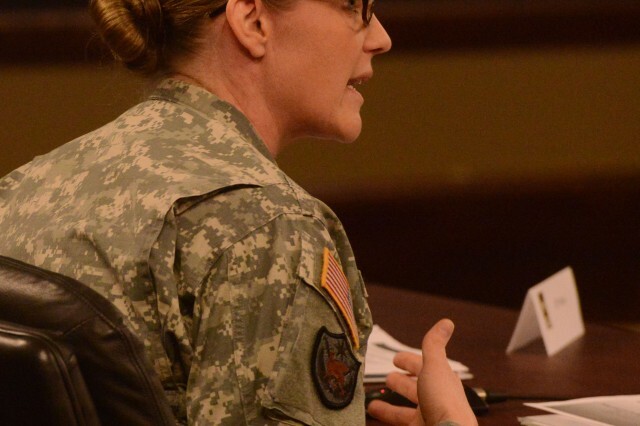 Sindi Connell, a Solarium participant from Fort Huachuca, Arizona, said that the Military Intelligence Center of Excellence there will be hosting a Solarium-like engagement between Soldiers across the Army's intelligence community and plans to use Red Team techniques to come up with innovative ideas. Capt. Michael Lynch, another Solarium participant, said that during Solarium 2015, there were so many varying views and opinions on every topic that it was sometimes "maddening," but also "enlightening." He said Red Team leaders at the event provided a "liberating structure" to get at problem solving.